Hanging fabric displays are a special category of tension fabric trade show displays that consists of an aluminum tube structure that is covered with a stretch fabric graphic to create a three dimensional hanging display. 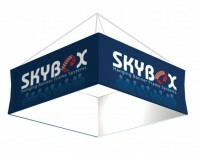 These 3D hanging displays are great for trade shows because they are visible to visitors across the entire show floor, ensuring that all potential customers will be able to find you. 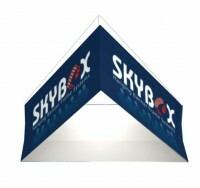 They can also be used in shopping malls, airports, stadiums, and retail stores, or any venue where having an overhead hanging sign that is visible from multiple directions is beneficial. We offer a range of different shapes and sizes that have proven to be the most popular, but even more sizes and shapes are available, so if you can't find what you are looking for, we encourage you to contact us for more options. Graphic Size 12' x 60"
Graphic Size 10' x 48"
Graphic Size 12' x 24-48"
Graphic Size 10' x 24-48"
Graphic Size 8' x 24-48"
Graphic Size 20' x 24-48"
Graphic Size 15' x 24-48"